Graphics can be used for a variety of reasons in the business setting. 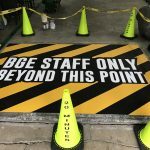 We often talk about utilizing vehicle graphics for mobile branding, window graphics for marketing and wall graphics for various purposes – but graphics can be applied on any space effectively if you consider the elements. We recently worked with Bruce Troville at Troville Insurance to add vehicle graphics to the rear window of his Expedition. Although we have done many graphics for vehicle throughout the years, this one was a bit different. Bruce wanted to use reflective vinyl so that his mobile branding could be seen during business hours and at night. When it comes to advertising, there are a variety of tricks and mediums available to any businessman or woman. 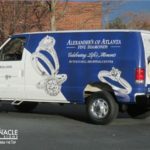 Each method has its pros and cons, but one form of advertisement that has little to no negative consequences is vehicle wraps. 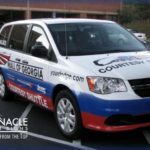 In the past we have always shared that the vehicle wraps are, hands down, one of the most cost-effective ways to advertise your business, particularly in Atlanta where traffic can be horrendous. Just think of how many hours a week you sit in it, and how many vehicles you see while sitting there. One recent trend we’ve been seeing is companies buying an older van, wrapping it and then parking it in their parking lot by the side of the road where the most traffic is driving by. This allows for additional visibility over and above their tenant slot on the shopping center’s entry sign(s), creating a virtual billboard that gets the business noticed while merely sitting there. 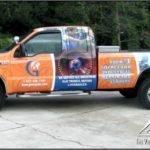 And, just like any other vehicle wrap or graphics, it also gives them the opportunity to advertise their business as they are conducting their day-to-day business.